The Earl didn’t check the provenance of the arresting officers – if such they were – but there wasn’t much in that, as anyone even with my limited magic could see, from the power coming off them, that they were powerful enough they could only belong to the Royal House. Of course, I thought with a pang, although it normally didn’t occur to us, travel into our universe being difficult, since we had more powerful magic than almost any other, it didn’t necessarily mean they were envoys of the king of Avalon in our world. It was something to remember when someone had just said that the Lady Helen had gone to another world, and also when it was obvious that we were getting a streak of rogue magic from another world. But the Earl didn’t do anything obvious to check it, and I hadn’t even thought about it till it was too late. As my mother used to say, what can’t be cured must be endured. This looked like one of those times to me. I turned to the chit of a maid, who sat there twisting a very pretty apron that was obviously ornamental, being all white and without a single smudge on it. “You heard what the Earl said,” I said. She nodded. She looked mortal scared, as though she were afraid I’d turn on her and accuse her of some crime. Look here, I know that I have one of those faces only a mother would think beautiful and even so my mother always told me things like “it’s not how you look, it’s what you do” and “You’re very well to pass” which I took to mean she wasn’t as easily deceived as mothers are supposed to be. Or perhaps that I was uglier than normal for mothers’ sons. It had never bothered me, and my homely face did all the turns I needed a face to do. Only perhaps, briefly, I’d wanted my wife to love me, but I think the problem there was that I was human and she was fey. Her eyes widened a little and she said, “You’re a magician, then?” which either meant her magic was very little indeed, or that she was being mendacious. I didn’t answer. I didn’t correct her, but followed her, up the back stairs of course, and through a maze of narrow corridors that I identified as the servant part of the house. They were well enough, mind, and clean, but there were no rugs on the floor, the walls were white washed, and the glimpse of the one room I caught behind a half opened door was narrow enough to be a monk’s cell and furnished as one would expect of a monk’s cell, with narrow bed, a wooden box at the foot, and a little table for your candle at night. None of this was strange to me, as my sister Agnes is in service, and I used to visit her when I was much younger. We went up two flights of stairs and around a few corridors, and then Annabelle opened the door to what was clearly the main portion of the house. At least we came out onto a landing paved in yellow and black marble, with a gilded table against the facing wall and a mirror in an elaborate frame above it. She looked one way and another and led me firmly down the hall to a door, which she opened. The room was not what I expected. I don’t, in faith, know what I expected. Perhaps watercolors on the walls, some musical instrument or some note of femininity. I’ve never, as such, been invited to female bedrooms, certainly had never been inside a room of a well to do female, but my sisters while they lived at home had furnished their space with embroidery and lace, and pretty things, as they could afford them. This room was somber, almost dark, with a four poster bed in the middle, with a plain white cover over it. There was a vast leather chair next to a very large table covered in books. There was a heavy and ponderous armoire, which managed to have piles of books on top. Various tables, scrupulously dusted, supported yet more books. For a moment I was taken aback, because I’d never have taken Lady Helen for a blue stocking. But then some of the titles on those books jumped at me, and I realized these books were in fact those things commonly called novels: made up stories of mad passion and dazzling adventure and sometimes both, which contain very little factual knowledge and which in fact, according to preachers, pave young girls’ path to perdition. I’m not wholly sure about that, as m’ mother likes a good novel, and we’ve all been known to read them when they’re adventure, taking turns reading aloud in the evening, while the girls are busy with their needlework and the men with other small tasks that might offer – and so far as I can tell none of my sisters has found that path to perdition and my mother might be the least perdition-ed woman ever. But surely these many novels, crammed in every portion of the room, seemed to betray a great urge to run away or to have adventures, or both. No wonder I thought, but then wondered if it was the novels that had caused the urge, or if in fact without the novels the Lady might have done something worse long ago. I had cause to think that I, myself, would long since have gone insane without the ability to dream of a better life, even if the dream would never come true for me or for that matter for Jimmy. Certainly not for Jimmy. I realized that while I’d been looking around at all the novels, I’d missed Annabelle lifting the mattress. Under it, like spilled gold and onyx were piles of hair clearly from two very different heads, one pale and sunny and the other black and twisty like an ivy plant. I thought of those dark curls framing the Lady Helen’s face and thought how well they suited her. If I hadn’t known the real thing and far too well, I’d have said her face had a touch of the fey – something not quite human and irrepressible. Only, of course, the fey aren’t like that. That is just what humans think of them. They are in fact almost totally devoid of emotion, or at least of emotions we humans can understand. As lief discuss poetry with an oak as have a talk of love with the fey. It was possible she was telling the truth. I put my hands on the hair, and tried to divine where the possessors of the hair had gone. The smell of spoiled fish, the roaring of the sea and the feeling of magic hit me so strongly I almost fell. I let go of the hair, and blinked. I knew now what Annabelle had meant. 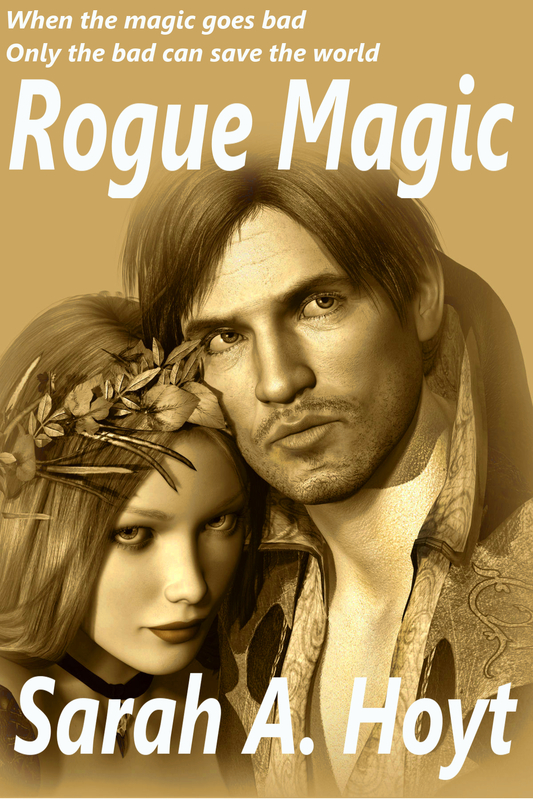 Wherever these girls had gone was where the strand of rogue magic originated. So now we pretty much know where Ginny came from. First off, an excellent (if short) chapter. We learn a bit more about Merritt, and we wonder a lot about the female characters. But it’s toooo shooooort! Mooooar! I wonder what they’ll name the heroines in Gothic novels set in the sea world? Finola, or The Mermaid Betray’d. A Fish Dinah in Memison, or, Earth Considered as an RPG Played with Semi-Precious Gods. Elizabite Be-netted, or, Fried and Horseradish. I love how every chapter is a different character’s first-person-caster’s point of view. Sadly, it will lead to some short chapters. A man like Wolfe Merritt, while he might be an interesting thinker, is not likely to be overtly wordy about it. yes. But mostly chapters grow till the middle, then they shrink again. I think my idea of chapters is odd. A good thing that so much of your audience is made up of Odds, then, isn’t it? When I first go into a group of people (real-time), I am very quiet. I will be the one sitting in the corner watching the action. I used to sit alone– but now I have the hubby with me. I will have to say that at the moment my opinion on conventional behavior in relationship to convention staff is decidedly colored — and that color is a marked shade of jade. I am seriously questioning whether or not most people have formed their social constructs sometime during their high school years — and that those they have modeled upon CW teen soaps. I meant attending cons — not organizing them. Dan and I did hospitality suite for a con ONCE. Note… ONCE. …I realized these books were in fact those things commonly called novels: made up stories of mad passion and dazzling adventure and sometimes both, which contain very little factual knowledge and which in fact, according to preachers, pave young girls’ path to perdition. Ah, but have we not had various discussion in this blog on how what people read can effect their view and expectations of the world around them. Escape, a kind of mini-vacation can be a good thing. But if you believe that the romantic fantasy world is and should be the real world, not necessarily so. Want to talk about leading to perdition? How many young women are now looking for their Edward, and what effect is this having on the world around them? BTW: I said not necessarily, because I recall that our esteemed hostess had once mentioned that, having read Heilein’s Have Spacesuit, Will Travel she was not sure how much of its depiction of life in the U.S. was fantasy.